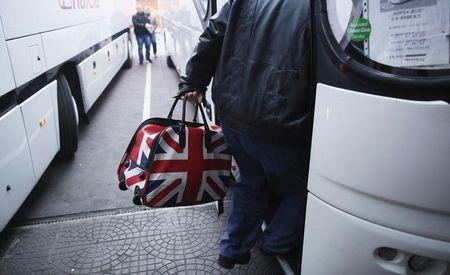 LONDON (Reuters) - Immigrants to Britain from the European Union have contributed more than 20 billion pounds to the British economy since 2001, according to a report on Wednesday on an issue dominating political debate ahead of next year's election. Prime Minister David Cameron, under pressure from the anti-EU UK Independence Party (UKIP), wants to curb EU immigration if he wins next May's general election, a plan which has drawn criticism from the European Commission and German Chancellor Angela Merkel. Immigration has overtaken the economy in some polls as voters' top concern, and with UKIP boosting its support in opinion polls to record levels, Cameron has hardened his stance on the issue. The study by researchers at University College London (UCL) concluded European immigrants had boosted Britain's public finances by more than 20 billion pounds between 2001 and 2011. Those who had come from the original 15 EU countries, such as France, Germany and Italy, contributed more 64 percent more in taxes than they received in welfare benefits, while most recent immigrants from central and eastern Europe had contributed 12 percent more than they got back. "A key concern in the public debate on migration is whether immigrants contribute their fair share to the tax and welfare systems," said Professor Christian Dustmann, co-author of the UCL study. "Our new analysis draws a positive picture of the overall fiscal contribution made by recent immigrant cohorts, particularly of immigrants arriving from the EU." The findings are a boost to supporters of Britain's EU membership who have long argued that free movement of labour was beneficial to the British economy. But critics say unlimited immigration has put huge pressure on local services such as health and housing, and many Britons are also worried about the social impact on their communities. "This report has taken a very narrow focus, it's not properly addressed the pressures on public services," Security Minister James Brokenshire, a member of Cameron's Conservative Party, told BBC TV. He said net migration from within the EU had more than doubled in the last 18 months, a period not covered by the report. "That is why the prime minister is absolutely right to focus on this issue of migration from within the EU," he said. "I am clear that levels of net migration at the moment are too high and are not sustainable." Cameron has promised to renegotiate Britain's EU ties should he triumph next May before holding an EU membership referendum in 2017. Merkel, a vital ally for Cameron if he is to wring change from the EU, has long made clear she believes the EU's freedom of movement regime is sacrosanct, and German media reported she was ready to abandon attempts to keep Britain inside the bloc if it tried to bring in curbs.